Identification: Fringes are white-tipped. 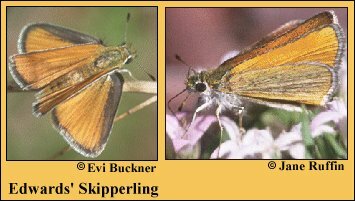 Upperside is brownish orange; forewing cell is brighter. Underside of forewing is brownish orange with black at the lower margin. Underside of hindwing is yellowish with orange on the lower margin. Life History: To find receptive females, males patrol the habitat with rapid flight. Flight: One brood in the Rocky Mountains from June-August; multiple broods in west Texas from April-September. Caterpillar Hosts: Possibly sedges (Cyperaceae) or grasses (Poaceae). Adult Food: Nectar from flowers including thistle (Cirsium species). Habitat: Chaparral, open woodland, grasslands, meadows. Range: Utah, Colorado, Arizona, New Mexico, and west Texas south to Puebla, Mexico.